Using GIS to investigate 50 years of changing land use in the Phoenx Valley. Forty-nine science, math, and technology middle and high school teachers participated in the Eyes in the Sky project. 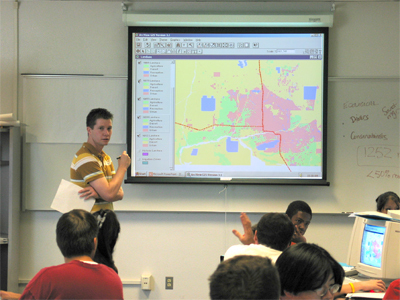 Beginning in the spring of 2004, we worked with three overlapping cohorts of teachers, providing them with eighteen months of professional development that consisted of a 12-week distance learning course, a two-week summer institute, and a classroom implementation phase, culminating in a research showcase. Participating teachers used geospatial technologies (e.g. geographic information systems, image analysis, global positioning systems) to carry out community-based research projects with their students. Eyes in the Sky was a regional program, reaching forty-eight teachers from rural and urban underserved populations in Arizona plus one teacher from New Mexico. The forty-nine teachers that participated in the Eyes in the Sky program teach a variety of subjects at forty-three different schools. The numbers of years they have spent teaching ranges from 2 to 27, with an average of nearly 12 years teaching experience. The subjects they teach include math and technology as well as span the sciences from biology to chemistry to physics to earth science. At 40% (17 out of 43) of the teacher's schools, 50% or more of the students are eligible for free or reduced price lunch. Averaging across the school profiles of participating teachers produces an "average" Eyes in the Sky school profile with student populations that are 40% caucasian, 39% hispanic, 5% african american, 2% asian, and 14% native american. This average school is 60% non-caucasian. In addition, this average school has 40% of the students eligible for free or reduced price lunch. Although the initial ITEST grant for Eyes in the Sky has ended, the project is still active. We have a set of GPS units that travel to Arizona teachers' classrooms and we have pursued additional funding to extend the program to reach a national audience. In addition, the Eyes in the Sky distance learning course can be offered to both preservice and inservice teachers.